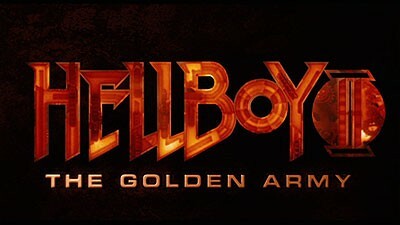 Hellboy, adapted by superstar fantasy director Guillermo del Toro from the dark paranormal comic book by Mike Mignola, was an excellent version of the character, infusing action with comedy and humanity to create an entertaining, energetic film about a fun, flawed hero and his battle against Nazis. After taking his creature-feature filmmaking to a new level with Pan's Labyrinth, del Toro returned to the big red guy and brought his refined visual polish with him to tell a new story of the supernatural. The results raise what could have been another summer blockbuster to the level of a fantasy classic. Hellboy (Ron Perlman), his pyrokinetic girlfriend Liz (Selma Blair) and amphibian teammate Abe Sapien (Doug Jones) return, living as agents of the Bureau for Paranormal Research and Defense, where they secretly work for the government, battling bad guys of the monster variety and staying out of sight from the general populace. When they investigate a swarm of killer fairies unleashed on an auction house, they find themselves drawn into a war between humans and the supernatural world. They soon discover the fairies were a weapon of Prince Nuada (Luke Goss), who wants to seize control of an army of unstoppable mechanical soldiers in order to reclaim the world from the humans who have abused the planet. The whole storyline of the humans and the fantasy world is told in a puppet story prologue, with an 11-year-old Hellboy and his adoptive father, in a gorgeously creative scene that sets the tone for the film. While the battle between Nuada and the humans, who are defended by Hellboy and his team, makes up the bulk of the film, including some epic battles, like Hellboy versus a building-sized plant creature, this is not a mindless action film. There's a storyline about responsibility winding its way through the film, that focuses around the immature Hellboy, as he has to decide what he wants from his relationship with Liz and decide if he's fighting the correct fight, as his desire to be a public hero is met with resistance from the people he's trying to help. 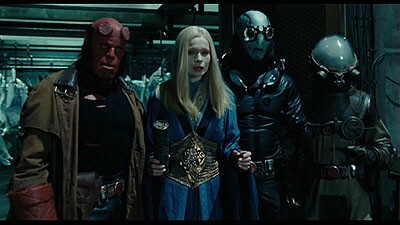 Because of this, Hellboy becomes a counterpoint to Nuada, who truly believes he is doing the right thing for his people. Though it's not the end of the story, things come to a head with the previously mentioned plant battle, as nature literally fights back against the city, and the results are beautifully sad. There was a tremendous amount of thought put into the tale, as it's entertaining and meaningful, a combination rarely seen in such movies. Though the emotional storyline is a big part of the film, the movie is a visual feast, representing del Toro's eye for the fantastic, as he loads Hellboy II with incredibly creative creatures and massively kinetic action scenes, all aided by a lack of reliance on CGI effects. Anyone who's seen Pan's Labyrinth knows what kind of imagination the man has, and it's on full display here, especially when Hellboy and company enter the world of trolls, elves and goblins. The intensive detail and creatively in the fantasy world calls to mind the greatest fantasy and sci-fi films, but it's all grounded in a very human reality, which is often missing from such flights of fancy. Sure, you've got this half-demon running around with a fish man and a woman who can light herself on fire, but if they don't have a reason to be together and a motivation to do the things they do, there's no reason to watch beyond the eye candy. That's definitely not a problem here, as you get a little bit of everything, including amazing sights, some touching romance, hysterical comedy and straight-up action, tied into characters who are easy to care about. Speaking of characters, this second Hellboy film adds some fantastic new players to the mythology, starting with the team's new leader, Johann Krauss. A disembodied spirit trapped in an odd diving-suit style body, this strict German (voiced by Seth MacFarlane of "Family Guy") is brought in to get an out-of-control team to fall in line. Though the visual look of the suit is impressive, the idea feels a bit weak...that is until he escapes his suit and shows what he can do, in one of the film's funniest moments and one of the best action scenes. 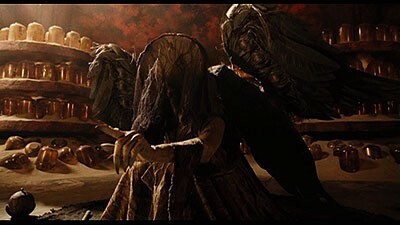 Del Toro's mastery of fantasy imagery helps create one of the most memorable creatures in recent film history, the creepy, yet fascinating Angel of Death, who will sear itself into your memory from the first moment it appears on screen. The same goes for the terrifying tooth fairies, an insect-like nightmare, and the Golden Army of mechanized combatants, who battle Hellboy in a classic brawl. As someone who watches a lot of movies, it's easy for me to say that it takes a lot to really grab me and make me pay attention. There are plenty of times I'll start watching a film and find my mind drifting, or reach for my laptop to check e-mail. So when shortly into this film I found myself just lost in the story, it really was clear to me I was watching something special. This film is what fantasy should be, melding a larger-than-life world of creatures and heroes with the realities of life, creating something that speaks to more than just the comic-book sensibility. Del Toro has shown he understands what a fairy tale is all about and that the art form didn't end with the stories told to children for decades. In his hands, fairy tales live and breath. 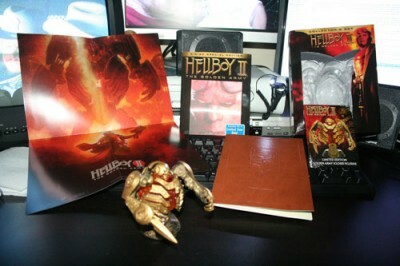 The collector's set of the special edition of Hellboy II arrives in a good-sized cardboard box with a plastic shell inside, holding the DVD and a few goodies (see The Extras for details.) The DVDs are held in a standard-width keepcase with a tray (while the third disc is simply in an envelope tucked into the case.) The keepcase is in a slipcover with an impressive lenticular animation that morphs the comic-book Hellboy into the movie version. 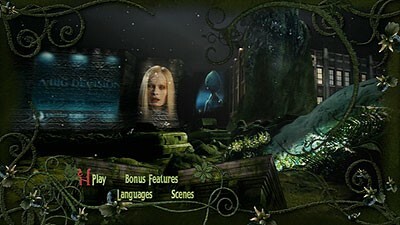 The DVDs feature well-done animated anamorphic widescreen menus with options to play the film, select scenes, adjust languages and check out the special features. Audio options include English, Spanish and French Dolby Digital 5.1, as well as a unique DVS (Descriptive Video Service) track, while subtitles are available in English SDH, Spanish and French. There's no closed captioning. The anamorphic widescreen transfer is just about as perfect as standard-definition DVD could be, delivering the film's incredible visuals quite well. The unique, deliberate color palette of the film is represented excellently, while the intricate digital animation in the film is integrated without standing-out to the eye, an issue with many special-effects films. Despite the high level of action in the film, there are no problems with digital artifacts, and, as expected, dirt and damage are no an issue. This is simply a great presentation. When you have a bombastic film like Hellboy II, you'd best bring the thunder when it comes to the audio, and the Dolby Digital 5.1 track does just that, putting you right in the middle of all the action. The sound moves around the room, with crashes and gunshots flying from speaker to speaker, and bass that enforces the weight of all this chaos. When you hear the sound of the tooth fairies swarming, prepare for some serious skin-crawling. Despite all the audio acrobatics, this film has many personal dialogue scenes, and the track handles them well also, along with Danny Elfman's effective score, making for an all-around wonderful soundtrack. Let's start with the goodies in the box with the movie, which includes a nice eight-page booklet with a stiff embossed cover that makes it look like a journal, which is appropriate, since it includes pages from del Toro's pre-production notebook, including drawings and noted (though the majority of the writing is in Spanish, so the value may be limited for many.) This is just a sample of what's available in a book of Hellboy II art (plugged in the intro), but it looks good nonetheless. Folded in four and stapled into the middle of the journal is a two-sided mini-poster with art by Del Toro and famed poster artist Drew Struzan. The images are impressive, but having eight holes down the middle of it (if you surgically undo the staples) is a bit of a bummer. The other inclusion is a 3 1/2-inch bust of a Golden Army soldier, done in plastic on a solid base. Described as a one-of-a-kind collectible (that's somehow included in a mass-market release), it is impressively detailed figure, with positionable arms and a core sculpted in translucent orange to capture the character's infernal glow. The only negative is the fact that the piece must be assembled, as the arms are separate from the body, and inserting the thin pins on the arms is not an easy fit. I pictured myself snapping them a few times, which would have sucked. The figure comes with a certificate of authenticity as well. The rest of the extras are the same as those included with the regular three-disc version of the DVD set. The first disc starts with a pair of audio commentaries, with del Toro up first on a solo track. Del Toro is a dream for fans of the audio commentary, as he knows something about everything that goes on in the film, and is never at a loss for words, discussing the production effort, sharing technical info and pointing out little details that aren't readily obvious. The director is also very honest about the movie, talking about the limitations of the budget, and also reveals just how much thought went into the story, as he chats about the themes in the film. The second track is less focused and informative, as Blair, Jeffrey Tambor (who plays the beauracrat responsible for Hellboy's team) and Goss get together to talk about the movie, covering their experiences during the production and generally hanging out. Blair and Tambor joke with each other often, in what's a friendly commentary that has the hard job of following del Toro's performance. Listen to them in reverse order to get the most out of them. Up next is a set of seven "set visits," a total of over 17 minutes of on-set footage taken from various points in the film. These are literally behind-the-scenes pieces, as you get to watch as the film is made, illustrating several different elements of the production. There's even more to see from the set in the "Troll Market Tour," as del Toro serves as a guide to the massively detailed set for one of the film's big battles. Only so much of the effort showed up on screen in the film, so this extra allows you to appreciate how much work and detail was involved here. A set of six deleted scenes, which run about five minutes long, are also found on the first disc, but they don't offer up anything dramatically different, outside of a few nice Liz moments. These scenes have optional commentary from del Toro, who uses the time to talk about changes made to the scenes or why they were cut. There's also an mildly animated piece of comic art that acts an epilogue to the film. I assume it sets up a potential third sequel, but based on del Toro's many comments in this set, that's far from a definite possibility. The second DVD kicks off with a video introduction from del Toro, followed by the mammoth Hellboy: In Service of the Demon, a feature-length look at the making of the film, that actually runs a full 35 minutes longer than the two-hour film itself. Despite the length, it's in no way padded, as you get an incredibly in-depth look at how the movie came together, from sitting in on pre-production meetings, to going into the special effects shop, to being on-set for filming, to the post-production effort (including the introduction of MacFarlane), while interviews with del Toro, Mignola and the cast and crew fill in the blanks where the visuals don't tell the whole story. The biggest strength here actually is the length of the film, as it gives the space to tell the whole story, like when Jones is prepared to play the Angel of Death. Instead of a sped-up make-up chair montage, we sit with him as he goes through the meticulous process, and get to learn about the costume and special effects that go into the character's breathtaking look. Multiply that effort by the number of set pieces in the film and you end up with what's easily one of the finest documentaries on film production I've ever seen. Production Workshop is a storyboard comparison of the story told by Hellboy's father, starting with an explanation from del Toro. It gives a chance to see how del Toro envisioned the concept, how Mignola designed it and how it eventually looked in the film, via a three-way split-screen. It's one of the few elements on this set I didn't find fascinating, but it's worth a look to see Mignola's sketches. 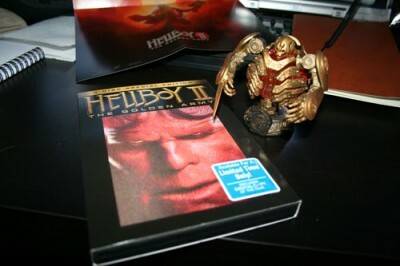 Watching it with the optional commentary by del Toro is much better, as he walks you through the concept. The pre-production vault offers more of what you get in the physical journal, as you get a chance to look further into del Toro's notebook, as explained by del Toro in another video intro. Flipping through the pages manually, you'll find six short video clips with del Toro, focusing on the ideas in the book, including the design and concept of several parts of the film. There's also a separate four-part gallery, with a chance to check out 174 pictures of creature and prop designs, 67 images of Mignola's monster art, 83 pieces of costume and set designs, and 14 still photos from the set. All of it is great to look at, but the Mignola art has the bonus of being able to look at the art as a slideshow with commentary from the artist, as he talks about what he was drawing. There's still more ephemera though, as we enter the marketing campaign, which offers up the worldwide poster designs used for the film, along with wealth of poster concepts that were scrapped (which is always a favorite feature for me as I love to see what graphic designers have tried, only to be stopped by marketing people.) The "bling" poster alone makes this deep section worth checking out. Pop the second DVD into your DVD-ROM drive and you get a printable version of the script, which is just the cherry on top of this incredible sundae. The final extra is the reason why this is a three-disc set, as the third platter has a digital copy of the film that can be transferred to a computer or a portable media player, with the use of a code included in the package. I'm not someone who watches movies on my iPod, so the value of this feature is minimal to me, but it does bug me that the code mentions that it may not work after October 31, 2009. So, basically this is a DVD that expires? Didn't we learn a lesson about that for the failure of DIVX? Perhaps it's some perspective gained with age or just the influence of my little daughter's innocent wonder at the world, but more and more, I find myself enjoying fiction that revels in fantastical beauty and romance, and Hellboy II is another example of a movie that reaches the heart, while entertaining the mind and pumping up the adrenaline as well. The DVD set maintains the incredible standard set by DVD god Guillermo del Toro with his past films, offering up an excellent spread of bonus material, and throws in some neat tchotchkes to boot. While the movie and supplements make the 3-disc special edition a must-have for anyone, interest in this collector's is limited to those who enjoy paying for an admittedly-cool plastic collectible. Either way, with hours of interesting and entertaining material to check out, I couldn't justify any rating lower than the DVDTalk Collector Series.